A weather decision support platform that provides a comprehensive global view of the latest 15-day forecast, including dynamic alerts and notifications. 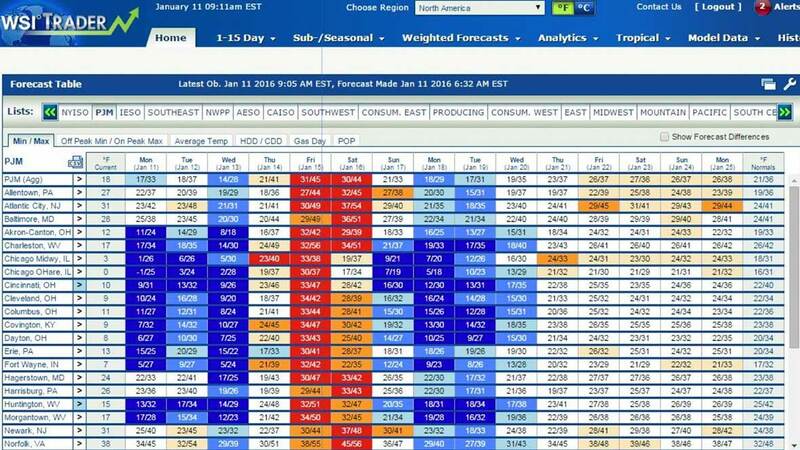 The Weather Company Energy Trader homepage includes forecast alerts and product notifications, a configurable forecast table, a view of the latest weather data, region-weighted forecasts, an interactive map and more. Create up to eight customizable city lists, configure forecast alerts and product notifications, and access your customized settings from any computer. Model data is quantified and presented for key ISOs, countries, and gas regions in an actionable format via tables and graphs that are updated in real time. This platform also provides the ability to visualize all model runs over the past 24 hours and compare to the latest forecast data. Visualize in one display the forecast uncertainty for the next 15 days for any city or region, including historical and forecast precipitation graphics centered over the key hydro regions. You can also view three-day hub-height wind speed forecasts centered over key wind regions, and visualize the movement of fronts and pressure centers over the past 24 hours as well as for the next two days. The Weather Company Energy Trader Premium Package gives commodity traders, analysts, and meteorologists access to the latest weather forecasting technology serving global markets. Gain a competitive advantage to maximize your time and increase your revenue by adding these enhancements to your subscription.